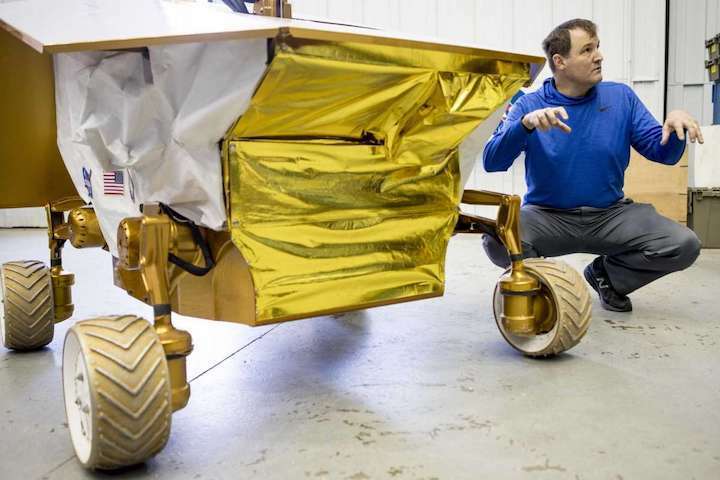 Bill Bluethmann, a robotics enginer at Johnson Space Center, talks about at the Resource Prospector 2015 Rover Prototype at the space center in this November 2017 file photo. The Resource Prospector 2015 Rover Prototype is shown at Johnson Space Center on Thursday, Nov. 30, 2017, in Houston. The rover is designed to drill into the moon's crust in search of water. Instruments from a lunar rover abruptly cancelled by NASA last year will be used in future missions to the moon, NASA officials confirmed Thursday. "It's really critical: We want to do whatever we can from the science side to look at" resource prospecting," said Thomas Zurbuchen, associate administrator of NASA's Science Mission Directorate, during a livestreamed news conference in Washington, D.C., Thursday. NASA abruptly canceled the rover, known as Resource Prospector, in April after sinking more than four years and $100 million into it. It was being built by the space agency to find water on the moon. The agency quickly replaced Resource Prospector with moon landers built by commercial companies as part of a new strategy in which the space agency is a customer rather than a builder. Nine companies were chosen to build those landers in November, including Houston-based Intuitive Machines. The companies will build the landers but not necessarily the science experiments and instruments that are sent to the moon. Instead, NASA will present them with projects they can bid on to transport there. Some of those projects will be NASA's. Agency officials have waffled on whether Resource Prospector's instruments will be used moving forward. NASA said Thursday they will, and the full list of 12 payloads that will rocket to the moon on the commercial landers will be announced next week. Resource Prospector was slated to fly in 2022 or 2023. Much of the work on the rover was being done at Houston's Johnson Space Center. The hope is that the commercial companies will be able to launch by the end of the year or early 2020. Increased commercialization of space has been a key talking point of Trump’s administration in his quest to return to the moon as a stepping stone for Mars. For example, Trump has called for NASA to transition activity on the station to commercial companies and an end to federal funding after 2024. The push follows one started in 2014 — prior to Trump’s presidency — in which SpaceX and Boeing will become the first commercial companies to send crews to the International Space Station, eliminating the nation’s dependence on Russia to ferry astronauts to and from the orbiting laboratory. The commercial crew program has faced numerous setbacks and delays, most recently with an investigation by NASA into the workplace culture at both Boeing and SpaceX. And many oppose Trump’s plan for the space station, saying companies likely won’t be ready to take on the fiscal responsibilities that come along with the station. Just in fiscal year 2017, NASA spent $1.45 billion on the space station — not including the costs to transport astronauts and supplies there. Even Bridenstine has said that ending federal funding for the space station after 2024 isn’t feasible.